Pub Cakes + Chocolate Winner! The best thing about having my birthday at the beginning of July? Usually an extended loooooong weekend! A long weekend to sleep. A long weekend to watch movies. And long weekend to indulge in birthday cupcakes! 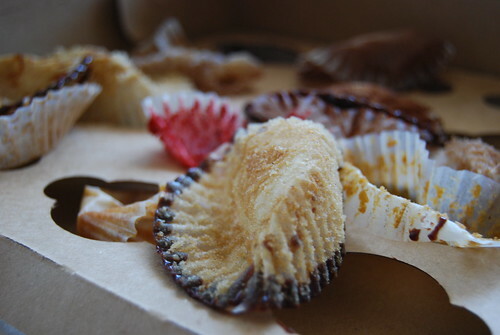 For my birthday this year, I decided to make it all about relaxing: I got in my daily morning walk, got a pedicure, ate some BBQ and ate an entire selection of cupcakes from Pub Cakes. I’ve been wanting to go to Pub Cakes for months. Unfortunately, I was really sick when they initially opened up earlier this spring and never had an opportunity to taste them. Until now. Other bloggers have written posts about them here and here and I agree they’re definitely worth tasting regardless of whether you like beer or not. 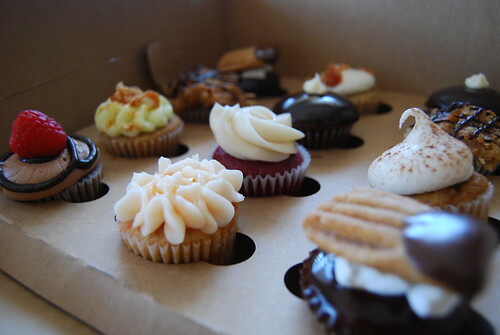 Go ahead and try the full-size version, but if you want to try a small taste of each, I recommend trying mini cupcakes. Just don’t have them all within 20 minutes— like I did. As for the winner of the chocolate giveaway from Max Brenner the number chosen from Random.org is commenter number 24* — Lyta! Congratulations Lyta, please email me your mailing address and I will get the chocolates mailed out to you in a jiffy! *Comments included do not include responses or people that commented more than once. So which flavor(s) were your favorite? I really liked the Irish Carbomb and the speciality of day, S’more. i like the stoned portzilla the best followed by the top ten (which has cherry icing w/chili powder on top). i could finish off a box (of mini’s) myself if given the chance!